Are You Struggling to Find a Cheap Spanish Property? What is a Cheap Spanish Property ? Is any property below €50,000 a cheap Spanish property? Are cheap Spanish properties only to be found at auction or as bank repossessions? How much below market value does a Spanish property need to be to be considered cheap? The truth is, even taking current market conditions in to account, In Spain, you get what you pay for. Spanish banks and building societies are often prime sources of cheap Spanish properties as they repossess them to pay off the outstanding debt. While there are genuine Spanish property bargains available in this way, most are never advertised or made available to the general public. Some Spanish banks admit that the best properties are first made available to their own employees and, by extension, their friends and family. Given that the largest Spanish bank, Banco Santander, employs over 130,000 people worldwide, it’s easy to see how the most attractive and cheapest Spanish properties are snapped-up by a network of hundreds of thousands of people ‘in the know’ – long before the left-overs are made available to the general public. Additionally, in the past when the banks were happy to lend in excess of 100% of the market value of a property, many of today’s ‘cheap’ Spanish properties were originally artificially over-valued. This means that even when offered for sale to clear the debt, such ‘cheap’ Spanish properties are still over-priced. Just because a property is for sale at debt value, or direct from the bank does not automatically make the property a bargain or good value. The vast majority of cheap Spanish properties, including those marketed as distressed or repossessed or available at auction do not represent a genuine bargain, nor a substantial discount below the current market value. Many buyers assume that the surest way to secure a cheap Spanish property is to access repossessed properties direct from the bank. However, this approach has two major drawbacks. First, the repossession process in Spain is extremely slow – sometimes in excess of 12 months. The owners of properties advertised today as ‘repossessed’, probably began defaulting on their mortgage payments 18 months ago. This time lag means that the property will have been ‘for sale’ internally within the bank – yet, 18 months later, still no buyer has been found. Although certainly not true in every case, most repossessed properties have already failed to find a buyer for at least a year, probably longer. The second drawback is related to the first, because time is money. The length and complexity of the repossession process adds significantly to the eventual sales price of the property. Repossession adds approximately 6% to the debt of an average property – a cost that is recovered from the buyer. For these reasons, pre-repossession properties are almost always more attractive to buyers because the time delay and expense of repossession are both avoided. In these cases, the bank or building society will negotiate a sales price with the current owner, and will hold off officially repossessing it until all reasonable efforts have been made to dispose of the property. However, it’s difficult for the general public to access such pre-repossessed properties, and to be able to reliably distinguish from overpriced properties and genuinely cheap Spanish properties. The upshot of all of these factors is that the market for truly cheap Spanish property moves very quickly. Once a property becomes available at a substantial discount below its true market value, there is no shortage of buyers willing and able to proceed with the purchase. Faced with this level of competition for cheap Spanish property, many buyers will never see, nor stand a chance of purchasing the most attractive bargain properties in Spain. 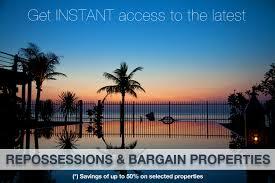 Now, because of the increasing number of ‘distressed’ Spanish properties, things are changing. This means that banks are having to take a different approach to disposing of properties where the debt has turned bad. Many of the larger Spanish institutions, have taken the bold step of making all their properties in danger of repossession available to the general public. Now, a select number of agents have been authorised to market these properties to the general public – at uniform pricing set by the Bank. Every week, many properties of all types fall into this category, and there are now systems in place to find buyers for these properties, without the time and expense of repossession – to the benefit of the buyer, vendor and the banks. There are properties all over mainland Spain and the islands – all available at the bank debt price, sometimes less. Additionally, many banks will finance up to 80% of the property and provides a mortgage pre-approval process – resulting in an agreement in principle, normally within 48 hours. Here at 4everspain.com we publish a Newsletter that features news, rumours and a property section where we list three Spanish properties at bargain prices. The newsletter is free and you can cancel at any time. Is this something you’d be interested in receiving?